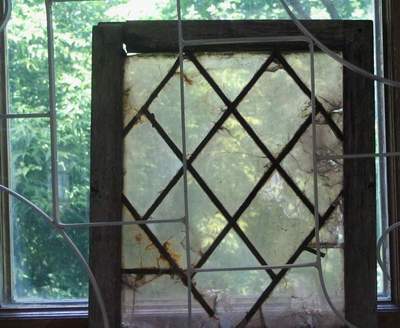 Muscovite from Northern Karelia in the window of XVII century. White to colorless, silvery-white, and tinged various colors by impurities. The earliest names attributable to muscovite include Muscovy Glass, Cat Silver, and Lapis Specularis (stone mirror); these names appearing in texts in the seventeenth century and before. 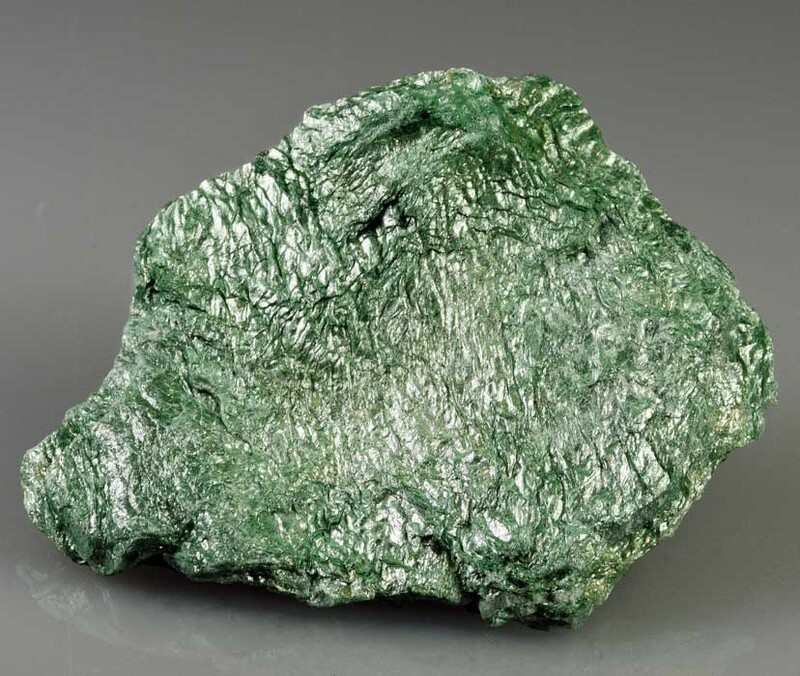 The stand-alone name 'Muscovite' was used as early as 1794 by Johann Gottfried Schmeisser in his System of Mineralogy and is derived from the term "Muscovy glass," which was in common use by that time. Muscovy Province in Russia yielded sheet mica for a variety of uses. Muscovite and sometimes similar species were earlier called mica (Phillips and Kersey, 1706), glimmer (Phillips and Kersey, 1706), and isinglass (1747 according to OED) but all of these terms are still in use to some degree. It should be noted that mica, glimmer, and isinglass were also used for a variety of materials before these given dates and in those earlier times did not always indicate what would be a mineral, much less muscovite proper. Isinglass, for example, was originally used for a gelatinous bladder found in sturgeon. The most common of the Mica Group minerals, it is typically found as massively crystalline material in "books" or in flaky grains as a constituent of many rock types. It is clear with a pearly luster on cleavage faces, often having a sparkly look in rocks. Several polytypes are known (see below); the most common one is the 2M1 polytype. 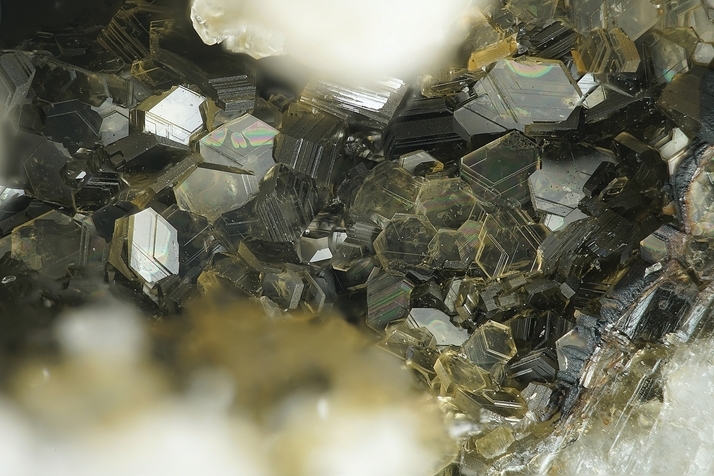 It can form a continuous series with celadonite and aluminoceladonite; intermediates are known as the variety phengite and K-deficient variants as illite. May be confused with margarite and several lithium micas. Visit gemdat.org for gemological information about Muscovite. Mesoarchean to Neogene : 2890 Ma to 13.4 Ma - based on 80 recorded ages. Data given are for the -2M^1 polytype. Adamsite A variety of muscovite, classed as a margarodite. Not to be confused with adamsite-(Y). Originally described from Derby, Orleans Co., Vermont, USA. Al-illite-hydromica Variety of Illite very low in K and high in water. Ammersooite A variety of Illite capable of fixing Potassium, from Dutch fields. Astrolite Spherical aggregates composed of radiating tabular crystals. Originally described from Pelz quarry, Diabase quarries, Neumark, Reichenbach, Vogtland, Saxony, Germany. Avalite A chromian variety of Illite. Originally described from Mt Avala, Belgrade, Serbia. Barian Muscovite A barium-rich variety of muscovite. Barian-Chromian Muscovite A barium- and chromium-bearing muscovite. Barium-Vanadium-Muscovite A barian vanadian variety of Muscovite. Originally reported from Silver Knob, Fish Camp, Yosemite Valley, Mariposa Co., California, USA. Chacaltaîte A green chlorite-like varety of muscovite. Originally reported from Chacaltaya mine, Mt. Huayna Potosí (Huaina Potosi), Murillo Province, La Paz Department, Bolivia. Chromian Sericite A chromium-bearing variety of sericite. See also fuchsite. Damourite Very fine-grained, compact muscovite - with a greasy feel, "serpentine-like," and often a fibrous appearance when viewed from a certain direction. Ferroan muscovite An Fe(II)-bearing variety of muscovite. Fuchsite Greenish variety of muscovite, high in chromium (trivalent Cr replaces Al in the crystal structure). Note that trivalent V can also cause a greenish colour in muscovite (cf. vanadian muscovite, roscoelite). Gieseckite Pseudomorphs of muscovite after an unknown mineral. Gilbertite Compact variety of muscovite. Liebenerite Muscovite pseudomorphous after nepheline, possibly also after cordierite. Nickeloan Chromian Illite The illite and a Ni-dominant trioctahedral mica are said to contain up to 22.8 wt.% NiO and up to 11.0 wt.% Cr2O3, which would be the largest as for world's micas at all. Oellacherite A green to colorless, Ba-bearing variety of muscovite intermediate in chemical composition between true mica and brittle mica. Persbergite Muscovite pseudomorphous after nepheline. Not to be confused with pajsbergite. Pig's Egg A pseudomorph of fine-grained muscovite ("sericite") after orthoclase, found in kaolinized granite. Rubidian Muscovite Rubidium-bearing muscovite with Rb2O contents of 1 and more mass%. Usual rock forming mineral in late stages of the evolution of many granitic rare-metal (Ta,Be,Cs) natro-lithian pegmatites. Schernikite A pink variety of muscovite, described by Bowman (1902). Sericite A term for a fine-grained white, pale green to oily greenish mica, mainly Muscovite (rarely Paragonite). Star muscovite Muscovite forming star-shaped crystal aggregates. Especially nice specimens come from pegmatites in the Jenipapo district, Minas Gerais, Brazil. Vanadian Muscovite A V-bearing variety of muscovite. Intermediate member of muscovite-roscoelite solid solutions. 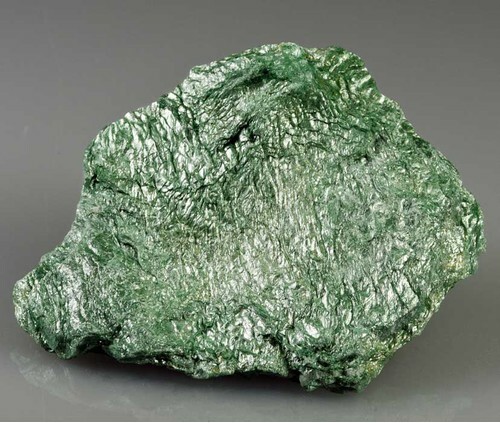 Verdite Trade name for a green ornamental stone, primarily an impure Fuchsite mica originally from North Kaap river, Kaap Station, South Africa. Wilsonite Described as an Mn-bearing "sericite" or muscovite pseudomorph after scapolite. Hey lists it as an aluminosilicate of Mg and K.
Zincian Muscovite Zn-bearing variety from the "Mixed Series" formation, Nežilovo, Macedonia. Associates, i.a., with ferricoronadite. Quartz 1,167 photos of Muscovite associated with Quartz on mindat.org. Albite 1,013 photos of Muscovite associated with Albite on mindat.org. Aquamarine 882 photos of Muscovite associated with Aquamarine on mindat.org. Fluorite 817 photos of Muscovite associated with Fluorite on mindat.org. Fluorapatite 652 photos of Muscovite associated with Fluorapatite on mindat.org. Spessartine 415 photos of Muscovite associated with Spessartine on mindat.org. Schorl 392 photos of Muscovite associated with Schorl on mindat.org. Scheelite 384 photos of Muscovite associated with Scheelite on mindat.org. Microcline 349 photos of Muscovite associated with Microcline on mindat.org. Smoky Quartz 307 photos of Muscovite associated with Smoky Quartz on mindat.org. Woodard, H.H. (1951) The Geology and Paragenesis of the Lord Hill pegmatite, Stoneham, Maine. American Mineralogist: 36: 869-883. Heinrich, E.W., Levinson, A.A. (1953) Studies in the mica group: mineralogy of the rose muscovites. American Mineralogist: 38: 25-49. Yoder, H.S., Eugster, H.P. (1955) Synthetic and natural muscovites. Geochimica et Cosmochimica Acta: 8: 225-280. Nicol, A.W. (1964) Topotactic transformation of muscovite under mild hydrothermal conditions. Clays and Clay Minerals: 12: 11-19. Güven, N. (1967) The crystal structure of 2M1 phengite and 2M1 muscovite. Carnegie Inst. Washington Year Book: 66: 487-492. Güven, N., Burnham, C. W. (1967): The crystal structure of 3T muscovite. Zeitschrift für Kristallographie, 125, 163-183. Brearley, A.J. (1986) An electron optical study of muscovite breakdown in pelitic xenoliths during pyrometamorphism. Mineralogical Magazine: 50: 385-397. Guggenheim, S., Chang, Y.-H., and Koster van Groos, A.F. (1987) Muscovite dehydroxylation: High-temperature studies. American Mineralogist: 72: 537-550. Guidotti, C.V., Mazzoli, C., Sassi, F.P., Blencoe, J.G. (1992) Compositional controls on the cell dimensions of 2M1 muscovite and paragonite. European Journal of Mineralogy: 4: 283-292. Gaines, R.V., Skinner, H.C.W., Foord, E.E., Mason, B., Rosenzweig, A. (1997) Dana's New Mineralogy: The System of Mineralogy of James Dwight Dana and Edward Salisbury Dana: 1448. Busigny, V., Cartigny, P., Philippot, P., Javoy, M. (2003) Ammonium quantification in muscovite by infrared spectroscopy. Chemical Geology: 198: 21-31. 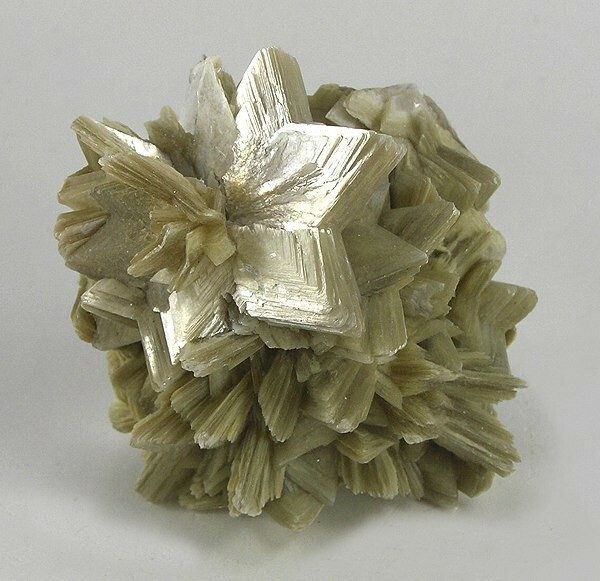 The following Muscovite specimens are currently listed for sale on minfind.com. Showing 19 significant localities out of 27,936 recorded on mindat.org. Mineralogical Magazine 1902 13 : 97-121.; Scovil, Jeffrey A. (1992): Famous Mineral Localities: the Gillette Quarry, Haddam Neck, Connecticut. (Mineralogical Record, 23(1):19-28. ); Cameron, Eugene N. and others. (1954) PEGMATITE INVESTIGATIONS 1942-45 NEW ENGLAND. U.S. Geological Survey, Professional Paper 255. Cameron, Eugene N., Larrabee, David M., McNair, Andrew H., Page, James T., Stewart, Glenn W., and Shainin, Vincent E. (1954): Pegmatite Investigations 1942-45 New England; USGS Professional Paper 255: 333-338.; Sterrett, Douglas B. (1923), Mica Deposits Of The United States, USGS Bulletin 740: 65-67. Januzzi, Ronald. (1976), Mineral Localities of Connecticut and Southeastern New York State. Taylor Associates/Mineralogical Press, Danbury. Dana 6: 1088; Rocks & Minerals: 10: 121-122,146-147.; USGS Bull 380D; U.S. Geological Survey, 2005, Mineral Resources Data System: U.S. Geological Survey, Reston, Virginia. ; Norton, James J. (1964) Pegmatites and other Precambrian Rocks in the Southern Black Hills; Geology and mineral deposits of some pegmatites in the southern Black Hills, South Dakota. USGS Professional Paper 297E.